CEDAR RAPIDS, IA – November 2014 – Orchestra Iowa and Ballet Quad Cities, presents Pyotr Ilyich Tchaikovsky’s The Nutcracker on Saturday, December 6 at 2:30 and 7:30 PM, and on Sunday, December 7 at 7:30 PM at the Paramount Theatre in Cedar Rapids. 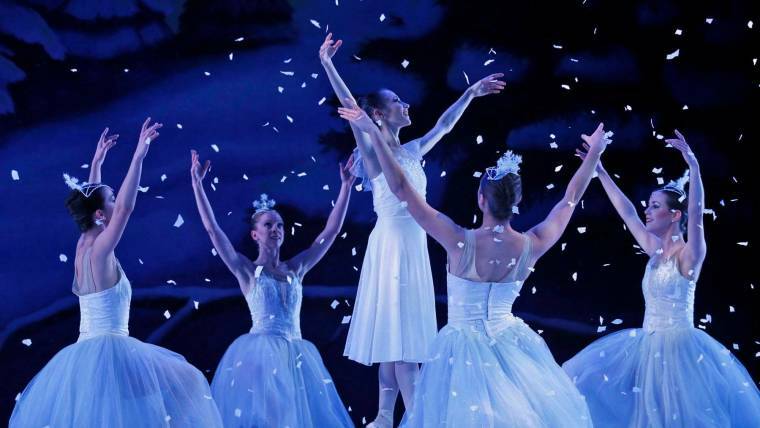 Let your holiday spirit soar with this festive family-friendly ballet. Adventure awaits as Clara and her Nutcracker Prince battle the Mouse King and embark on a journey through the Land of Sweets with the Sugar Plum Fairy. Led by Quad Cities own Dan Allcott and the magnificent dancers from Iowa’s only professional ballet company, this joyous classic will leave you with cherished memories for years to come. Orchestra Iowa and Ballet Quad Cities have joined forces to perform this celebratory ballet in the past three years. They have received glowing reviews, including a nomination for a 2013 Upper Midwest Regional Emmy®. Make this holiday masterpiece a custom for family and friends by experiencing it again this year and for years to come. Tickets for the performance range in price from $19-$49 and may be purchased online at orchestraiowa.org or by calling 319.366.8203.Children 18 and under are eligible for half price tickets and group pricing is available. Tickets are also available through the Orchestra Iowa Ticket Office, 119 Third Avenue SE, Monday – Friday, 10:00 AM – 5:00 PM, and Saturday 10:00 AM-1:00 PM. Orchestra Iowa is recognized as the state’s premier symphony orchestra, under the direction Timothy Hankewich, now in his ninth year as Music Director. Founded in 1921, the mission of Orchestra Iowa is “to foster enjoyment of, and support for fine symphonic music through quality performances, education, and community involvement”. Its 68 professional musicians perform more than 188 public performances throughout the year, many of which can be heard on Iowa Public Radio and seen on Iowa Public Television. Orchestra Iowa showcases its artistic excellence each season through an accomplished array of classical, ballet, opera, popular, and chamber performances, in addition to extensive community education and involvement. Founded in 1996 by Executive Director Joedy Cook and a dedicated Board of Directors, Ballet Quad Cities is now celebrating most exciting season yet. Way back in 1996, the company began with one paid dancer and a young, talented Artistic Director, Johanne Jakhelln. Before returning to her native country of Norway in 2005, Johanne created over 40 original ballets. Today’s versatile company consists of eleven highly trained full time professional dancers led by Artistic Director Courtney Lyon. Ballet Quad Cities provides both classical and contemporary dance to the entire bi-state region through outstanding performances, entertaining lecture-demonstrations and innovative educational outreach programs for people of all ages.